Sometimes there's a possibility that everything in life looks pretty straightforward. It all depends from person to person how do you want to conceive it or how do you want to go about it. But remember there's always a storm hidden behind a prolonged calm. 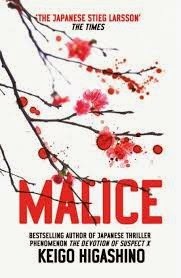 Author Keigo Higashino in his latest book "Malice" gives the readers a situation before and after a storm which will wither out the effects completely. So what does the author has up his sleeve to trick the readers into this calming yet whammy inconsistency? Let's find out. Celebrated novelist Kunihiko Hidaka is found inhumanly murdered in his home. He was supposed to leave for Japan the next morning, and relocate to Vancouver. But his murdered body is found in his office – a locked room. His wife and his best friend seem have strong alibis. Police Detective Kyochiro Kaga identifies Hidaka’s best friend, Osamu Nonoguchi, at the crime scene. They were both teachers at the same public school many years ago. Kaga joined the police force and Nonoguchi became a full-time writer, although he was not as famous as Hidaka. As Kaga investigates the murder case, he unearths evidences that show that the relationship between the two writers was very different than it was known to the outsiders. Kaga must discover the truth and find out why Hidaka was murdered. Will he be able to solve the mystery? First look at the title and the cover and the cover fails to put things in to the right perspective. It's a pale version of dry and withered tree or blossoming and botched effect of red but it doesn't seems correct. The title is a one word tragedy which defines the book and the story. It's meaning far from what it looks to be on the cover of the book. The blurb talks about a celebrated author and his murder and how simply a case turns into a nightmare for many. The blurb gives away the story but sadly that is not the case here. It just holds up and stirs up the right amount of excitement for the readers. The story is set in Tokyo where Hidaka a celebrated author has been found murdered in his house under mysterious circumstances. It brings forth a list of suspects including his very good friend Nonugachi and his wife too. But for Inspector Kaga all it takes is one good look at the crime scene and few possible leads to stir up a national tragedy. So how will Kaga go about it? Is it going to be a hit and miss affair or the case is going to prove a tough nut for Kaga? How much of Nonugachi and Hidaka's wife will be helpful to the case? What brought the downfall of Hidaka in the end? That's what the story is all about. Leniency is the mother of all the tragedy. Over-smartness the father of all the embarrassment. The story is set off in a way that it truly defines the literature and celebrates the existence of crime and thriller. The motion and chain of events which spark off the eventuality and the simplicity with which it deals with the entire drama fools the readers beyond limits. There is enough spice to set fire and enough wood to build a house in the story. It's a character driven plot and makes even the nonchalant of the details look gigantic. The microscopic factors playing the lead and driving the entire momentum. The thrust of the story is it's twist in the tale where it all stops and starts all over again. The book hardly leaves breathing space for it's readers. The only downside of the book is it's end which gets dragged on endlessly and becomes a dull affair. A toned down nature of the end part of the book would have helped it's cause a great deal. All in all it's the unlikeliest of the battles of wit and glory. Everything from personal lives to relationships to personalities is at stake in the story. Either you come out a winner or become a sore loser. It has a meaningful introspection and works rigorously hard to charm the readers. There's no holding back once the action unfolds as it hits you hard and very hard. The story is "the best" saga of modern times. Nice article. Liked reading it. Well explained. Seems it has lots of suspense in it. Will surely go through...Thank u for the share.